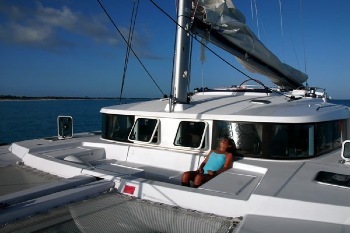 Crewed sailing yacht Oteka is a Lagoon 440 catamaran, owner version, launched in 2008 and available for charter in the BVI’s of the Caribbean over the winter and the Turks and Caicos over the summer. Accommodating up to six guests in three private cabins, Oteka’s clever interior and exterior design ensures all guests have plenty of space to relax, unwind and enjoy the stunning cruising grounds without feeling cramped. Oteka has a raised fly-deck which provides passengers with a 360 degree view of the ocean. The large bench seat at the helm station is a favourite place for sharing the pleasure of navigating, while the innovative forward cockpit is a choice spot to dream and reflect at sea or at anchor. 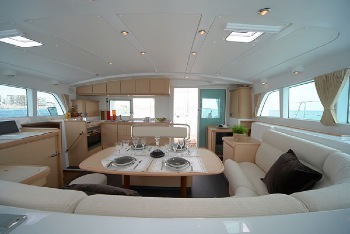 The spacious aft cockpit is protected by a hard-top bimini making the cockpit useable in all weather conditions. 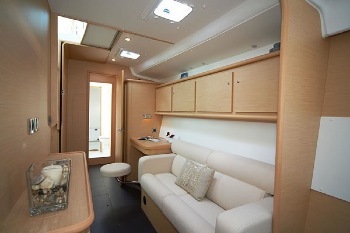 The bench seat in the cockpit can accommodate up to 10 guests for alfresco dining and the cockpit bar is easily accessible and seriously practical! 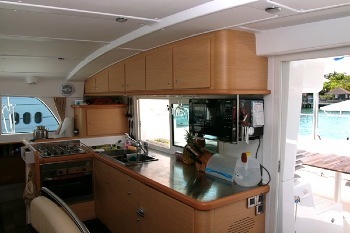 Inside, the saloon provides a 360° panoramic view. Whether you have an informal dinner with friends around the large varnished table or choose to relax around the coffee table in the wide sofa area, the saloon on Oteka is a superb living space. With its new 2008 design, the light oak Alpi woodwork and the laminated , give a modern and relaxing feel making this boat a joy to live on. Pat Beaufront, the captain on Oteka is a fully licensed Boat Master (first grade) and an upbeat character, patient and easy going. 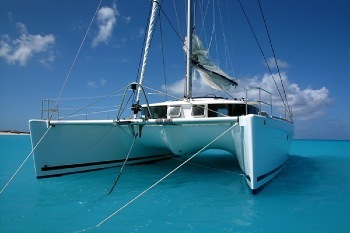 Guests will enjoy sharing conversations of his passion for the ocean and her navigation. Approachable and reassuring he will make himself as available or as sparse as you wish. He speaks French, English, and at times something resembling Italian. 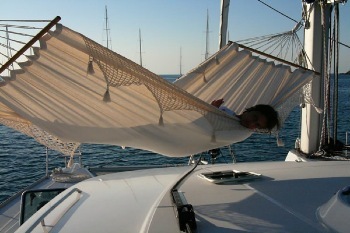 From November to April, Oteka will cruise the Virgin Islands of the Caribbean and the designated Mecca of Sailing. Alternatively, from May to October, She will cruise the Turks and Caicos. Be amongst the first to navigate this still little-known archipelago. -	The “CAPTAIN ONLY” cruise provides a skipper and is an economically viable. The freedom of organization is yours! You can add the option "provisioning" where the crew do shopping for you prior to your arrival, and an optional hostess. 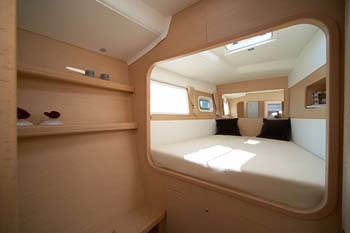 -	The “HALF-BOARD” option comes with your very own skipper and hostess and allows the ultimate levels of comfort and relaxation. We serve your breakfasts and lunches on board while leaving your evenings free to test the local restaurants, enjoy a barbecue on board or on the beach, or invite some new friends from the yacht next door and cook for them on board. Oteka holds up to six people in 3 double cabins each equipped with en-suite bathrooms. 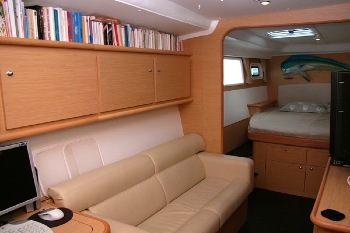 The aft cabins are large and feature a queen size bed! Large hull fixed windows in each cabin allow for lots of natural light and offer an unequalled view to the outside without impeding the exterior aesthetics of the boat. Paying respect to the environment, there is no AC, but optimal cabin ventilation is assured by numerous opening portholes and hatches. 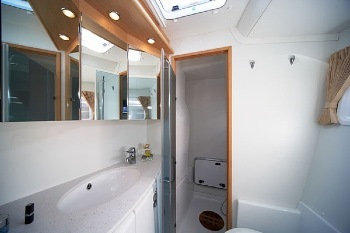 The entire starboard hull is transformed into a luxury suite incorporating the aft cabin, a sofa, a desk, a separate hanging locker, a bathroom with separate shower, cupboards, plenty of drawers and lockers. 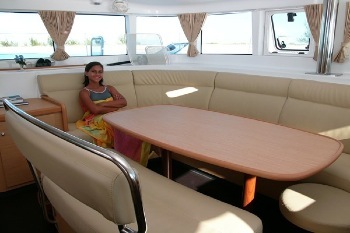 There is flat screen TV, DVD player and computer available while the boat is at docks. On-board, you have free access to snorkeling gears, tubing buoy, barbecue, hammock, huge collection of DVDs, books, games (cards, chess, etc…) Any type of activity can be arranged with local partners: we can rent for you Kayaks and all sorts of water toys, organize scuba diving or water skiing, horse riding, biking, hiking, and so on…Oteka is a non-smoking boat, pets are not allowed and kids of all ages are more than welcome.